Documents newly obtained by NPR show how he traveled throughout the United States to cultivate ties in ways well beyond his formal role as a member of the Russian legislature and later as a top official at the Russian central bank. These are steps a former top CIA official believes Torshin took in order to advance Moscow's long-term objectives in the United States, in part by establishing common political interests with American conservatives. "[Vladimir] Putin and probably the Russian intelligence services saw [Torshin's connections] as something that they could leverage in the United States," said Steve Hall, a retired CIA chief of Russian operations. "They reach out to a guy like Torshin and say, 'Hey, can you make contact with the NRA and some other conservatives ... so that we can have connectivity from Moscow into those conservative parts of American politics should we need them?' And that's basically just wiring the United States for sound, if you will, in preparation for whatever they might need down the road." Torshin's trips took him to Alaska, where he requested a visit with former Gov. Sarah Palin; to the National Prayer Breakfast in Washington, D.C.; to Nashville, where he was an election observer for the 2012 presidential race; and to every NRA convention, in various American cities, between 2012 and 2016. But the jig is up. Last month, Torshin was designated for sanctions by the U.S. Treasury Department. "We can conclude that the administration thought he was acting to advance Putin's malign agenda, but what precisely [he did] they did not make clear," said Daniel Fried, a former State Department coordinator for sanctions policy who helped craft the sanctions that ultimately were employed against Torshin. Torshin's outreach to the United States started well before Russia's now-public campaign of electoral interference during the 2016 elections. And it appears to be a cultivated effort to reach out to conservatives, even in its earliest stages. "I really do think the Russians are looking at being able to reach out to the right ... to say, 'Hey, you know Russians actually share a lot of the same values,' " said Hall, whose 30-year career in the CIA concluded in 2015. Hall said their message was: "You know, we don't like LGBT causes any more than you conservatives on the right in the United States do; we are interested in engaging the NRA ... the church plays an important role in Russia just as it should in the United States." Torshin's earliest known visit to the United States was in 2009, when he requested a meeting with former vice presidential candidate Sarah Palin — a request that has never before been reported. An email from the former Alaska governor's archives, released because of a public records request from activist Andree McLeod and posted online en masse by then-Alaska Dispatch News reporter Richard Mauer, shows how Torshin made the approach through the Russian ambassador to the U.S., who was then-Ambassador Sergey Kislyak. An aide wrote to Palin in May of 2009: "You had received a request to call the Russian Ambassador regarding a proposed visit by Mr. Alexander Torshin... Torshin will be visiting Alaska on June 6, 2009 and we have asked the Lt. Governor to meet with him." Neither the Russian Embassy nor Palin responded to a request for comment. The lieutenant governor at the time was Sean Parnell, who would go on later to become the governor of Alaska. Parnell told NPR he doesn't recall meeting with Mr. Torshin, nor did the name ring a bell — but he said it wouldn't be odd for him to take such a meeting. "It wouldn't be unusual for Alaska's Lt. Governor to take a meeting with a visiting foreign dignitary, especially if the Governor's Office had been approached first by the visitor/visiting delegation to schedule a meeting and the governor had declined," Parnell said in an email. Torshin's travels in the United States continued with a strange trip to Tennessee. Public records requests made by NPR shed light on how Torshin managed to become an election observer in Nashville during the 2012 presidential elections. "The interesting thing about election monitoring is it does get foreign officials out and about in places that they perhaps might not usually go," said Hall, the former CIA chief of Russian operations. "It wouldn't be uncommon for either somebody like Mr. Torshin, or a diplomat, or a Russian intelligence officer to appear in places like Washington or New York ... But a place like Nashville, or other locations in the United States, provide sort of an insight about what's really going on in the heartland." A memo left for Tennessee Secretary of State Tre Hargett on Oct. 11, 2012, shows that local lawyer Kline Preston, known for his support of Putin, made the application for election observer status on behalf of Torshin. "Russian Senator Alexander Torshin would like to observe our Presidential election. Polling stations," the 2012 message reads. An email from Tennessee Coordinator of Elections Mark Goins shows that Torshin requested visits to the Davidson County Election Commission and the Williamson County Election Commission. And a sign-in sheet showed that he visited the polling station at Grassland Middle School in Williamson County, Tenn. According to these documents, Torshin was accompanied by a Russian diplomat named Igor Matveev. Matveev had postings in Syria and the United States and is fluent in Arabic and English. Hall said that Matveev, who did not respond to a request for comment from NPR, fit the profile of a professional diplomat rather than an intelligence operative due to his background, "but basically the Russian intelligence services can and do oftentimes co-opt standard diplomats to do their bidding for them." Torshin made no secret of his visit to Tennessee, and posted it on Twitter, as he has many of his visits to the U.S. He even posted a photo of himself in line at a Nashville-area polling place. Translation: "Standing in line to the voting station. Like an average American. 6.45 am." Russia has a long history of politicizing the use of election monitors — for example using Western, pro-Putin observers to vouch for the validity of its contested elections. Preston, who arranged for Torshin's 2012 election observation status in his hometown of Nashville, recently went to Crimea. In a trip reported by a Russian state operated news agency, Preston declared that the election process in Crimea, which Russian annexed in 2014, was open, honest and trustworthy. He did not respond to a list of questions provided by NPR. There were very few international doubts about the fairness of America's 2012 presidential elections, which makes Torshin's visit to Nashville for this ostensible purpose all the more perplexing. And while there have been election monitors in the United States in the past, it usually involves an international organization like the OSCE, which during the 2012 elections sent 44 observers throughout the U.S. to monitor the elections. "There are, of course, no real elections in Russia that Vladimir Putin doesn't approve of and essentially run himself," Hall said. "So the idea that any Russian entity would go to be an election monitor anywhere in the world is, of course, on its face ridiculous. It's sort of like sending an alcoholic to the distillery to make sure that everything is going OK."
From 2012 to 2016, Torshin began making regular visits to the United States that suggested Russians were trying to find common cause on issues like religion and guns. Torshin attended every National Rifle Association convention during this time and met high-ranking NRA officials. These trips took him all across the American heartland, with stops in St. Louis, Houston, Indianapolis, Nashville and Louisville. Last month, the NRA acknowledged Torshin was a life member of the NRA and has been since 2012, but insisted he only ever paid his membership dues to the organization. The gun rights group said it had received $2,500 from about 23 Russia-linked contributors since 2015. "Based on Mr. Torshin's listing as a specially designated national as of April 6, we are currently reviewing our responsibilities with respect to him," NRA general counsel John Frazer wrote to Sen. Ron Wyden, D-Ore., last month. The NRA has denied wrongdoing and says that it does not accept funds from foreign persons "in connection with United States elections." Over a similar time period, Torshin also reportedly made repeated trips to Washington, D.C., to attend the National Prayer Breakfast — Yahoo reported that he even had a meeting scheduled with newly inaugurated President Donald Trump during the breakfast in 2017, but that the president pulled out at the last minute when an aide figured out who Torshin was. The White House did not respond to a request for comment. Further, Torshin facilitated reciprocal trips during these years in which he brought Americans to Russia. In 2013 and 2015, he hosted gun rights advocates in Russia, including former NRA president David Keene, whom he developed a close relationship with. His visits to America sometimes puzzled those who saw him there, as he appeared to have no serious expertise in the field he was purportedly representing. A speech Torshin gave in Washington, D.C., in March 2015, as deputy governor of the Bank of Russia, left some in the audience perplexed. "For anyone at the lunch who's remotely familiar with finance or the world of central banking, Torshin demonstrated no significant expertise in either realm," said a former U.S. official who was at the event. "Torshin's performance was all the more surprising, given the big questions circulating at that time about the fate of the Russian economy, sanctions, Western diplomatic isolation, and the like." In fact, for those observing Torshin, what he was best known for was not central banking, but allegations of money laundering. In 2013 Spanish authorities alleged that Torshin helped a Russian mob syndicate in Moscow launder money through banks and properties in Spain, according to a report by Bloomberg News. "It is extraordinary and outrageous that a man caught in international money laundering was appointed ... to become deputy chair of the Russian Central Bank," said Anders Aslund, a resident senior fellow at the Atlantic Council's Eurasia Center. Torshin's travels to the United States continued through to perhaps his most infamous trip: The NRA convention in 2016, where he attempted to get a meeting with then-candidate Trump. "Happenstance and the (sometimes) international reach of the NRA placed me in a position a couple of years ago to slowly begin cultivating a back-channel to President Putin's Kremlin," Erickson wrote to Rick Dearborn, a senior campaign official and a longtime adviser to Attorney General Jeff Sessions. That meeting never occurred — though Torshin did meet Donald Trump Jr. at an event during the convention. Trump Jr. claims they did not discuss the election. 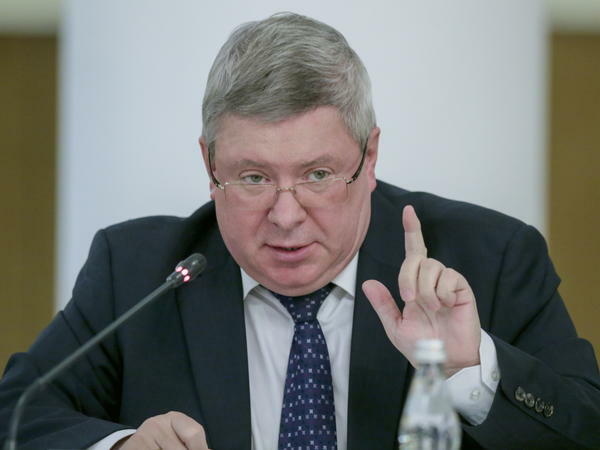 On April 6, the U.S. Treasury Department specifically designated Torshin as a target of U.S. sanctions — Treasury Secretary Steven Mnuchin said the agency targeted "those who benefit from the Putin regime and play a key role in advancing Russia's malign activities." The sanctions mean that any assets Torshin has in the United States could be seized, and the travel to America that punctuated his life for years will end. "He's, for lack of a better term, become radioactive, certainly to the United States, but really the global financial institutions, that are unlikely to be willing to do any business with him for fear of secondary sanctions from the U.S. Treasury Department," said Boris Zilberman, who works on the Foundation for Defense of Democracies' Center on Sanctions and Illicit Finance. He also reportedly faces scrutiny from congressional investigators probing the 2016 election and the FBI. McClatchy has reported that the FBI is investigating whether Torshin illegally funneled money to the National Rifle Association to help Trump's 2016 campaign. The FBI did not respond to a request for comment. Hall said it also probably reflected intelligence gathered on Torshin's intentions over years of travel to the United States. "The fact that Torshin has now been personally sanctioned ... is an indication that the administration ... has seen, probably, intelligence reporting on Torshin and his background, and perhaps what the plans and intentions of the Russian government vis-a-vis Mr. Torshin," Hall told NPR. "It shows that our system ... is doing its job in informing policymakers about the dangers of somebody like Torshin." For years, Torshin built relationships with governors, NRA bigwigs and conservative activists — making a point of traveling to the United States repeatedly to expand those ties. But with Torshin's designation as a target of U.S. sanctions last month, that door has been closed. Torshin did not respond to a list of questions provided by NPR. WPLN's Chas Sisk and NPR's Audrey McNamara contributed to this report.